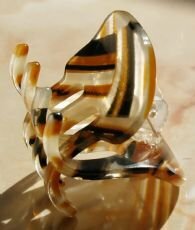 Have you ever bought a beautiful hair clip, only to have it break after a few outings? What good is a lovely decoration if the clip won’t hold your hair? Melissa Hill offers advice on how to select a great quality hair accessories. 1. Test barrettes and clamp springs before putting them in your hair. Not all clip mechanisms are the same. Bargain clips are often made with aluminium, which is lightweight and breaks very easily. When you put your hair in a barrette or clamp, the mechanism comes under a great deal of tension. So if the clip can’t take the stress, it will soon break under pressure. A good quality barrette, when snapped open, should spring open smoothly, with a medium pitched ping. Aluminium barrettes will spring open very quickly and shudder when snapped open and have a much higher pitched noise when released. When you open and release a hair clamp or claw, the harder you have to press, the stronger the spring and the longer it will last. 2. Test for finished edges. A cheap clip will have rough unfinished edges, which you can feel with your finger. These are sharp and can snag or even cut into your hair, leading to split ends. A good quality barrette should feel solid and smooth to the touch. With clamps and claws, the teeth should be softly rounded and finished to protect your hair. 3. Plastic decoration should have some flexibility to absorb the tension of the barrette or spring. Gently flex the decoration if it is plastic. High quality polymers will give slightly and return to position easily. Lower quality plastic can feel stiff, and over time will be come brittle. 4. Check for glue blobs. Decorations that have been glued badly to the mechanism will break pretty quickly. 5. 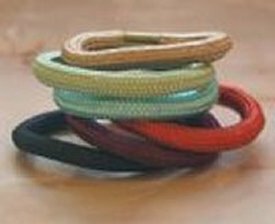 For hair elastics, stretch them out several times. Cheap elastics will go baggy, or even break, straight away. Good quality elastics will stretch only very slightly under this treatment, but will essentially retain their shape time and again. With hair accessories you get what you pay for. An expensive hair clip is not expensive if you are able to enjoy it for years to come.